SPECIAL BONUS OFFER TO THOSE THAT PURCHASE THE SYNAPSE FILMS VERSIONS OF “AT MIDNIGHT I’LL TAKE YOUR SOUL”, “THIS NIGHT I’LL POSSESS YOUR CORPSE” OR OUR NEW “THE COFFIN JOE TRILOGY” DVDS! 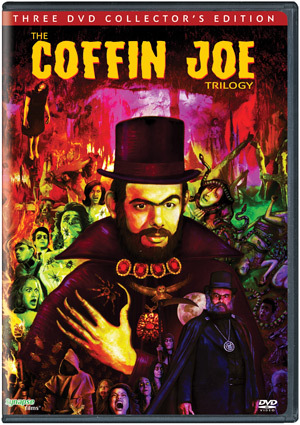 Synapse Films has a small quantity of some Brazilian “Coffin Joe” comic book reproductions. While supplies last, each person that orders the Coffin Joe films, from Synapse-Films.com, will receive a comic book with their order. Coffin Joe terrorizes a small religious community as he searches for the perfect woman to bear him a child, as the spirits of his murderous past come back to haunt him. NOT RATED / B&W / 82 MINS. Coffin Joe returns, with his new assistant Bruno, to help him on his quest to continue his demonic bloodline. Joe is haunted by nightmares when he kills a pregnant woman. NOT RATED / B&W (with color “Hell” sequence / 109 MINS. After being imprisoned in a mental ward for over 40 years, Coffin Joe is released and continues his murderous quest for “the continuation of the blood.” NOT RATED / COLOR / 94 MINS.